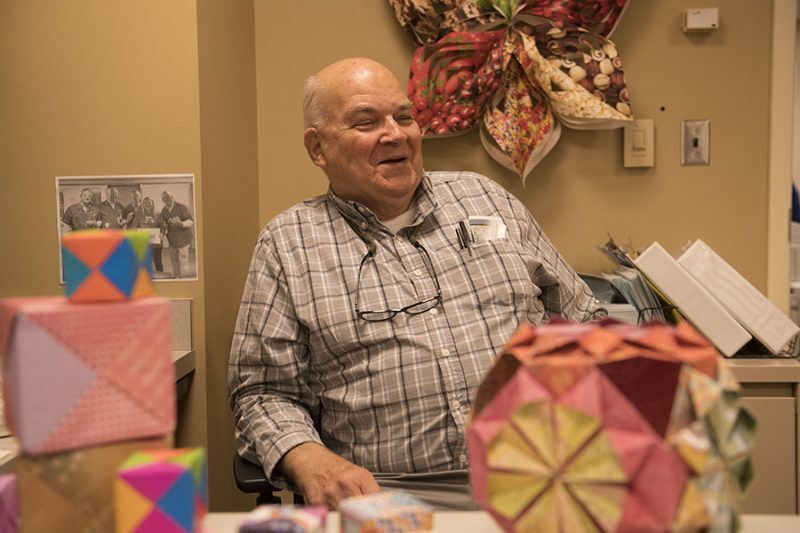 Volunteer Jim Kessell sits among the items he has made out of paper with our patients. Retiree Jim Kessell has been volunteering at Akron Children’s Hospital for 13 years. His special talent is what sets him apart from others – Jim is a paper engineer. What exactly is a paper engineer? He folds paper to occupy our patients while they’re waiting. It’s a perfect volunteer position for a retiree with a background in electrical engineering and training. Jim visits waiting rooms and patient rooms equipped with paper and a lot of creativity. 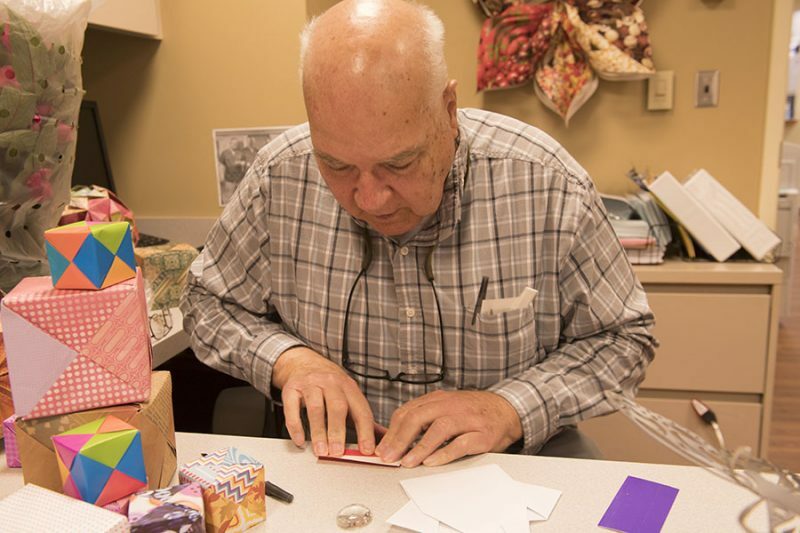 He teaches our patients to make items out of paper. His most notable item to make is a frog. Not just any frog – this frog jumps! Once he teaches the child to create the frog, then he shows him how to make it jump into a trash can that’s been turned into a target, complete with points for leaping through certain areas. He also provides the child with a piece of paper and has them keep track of their points, awarding prizes at different increments. Volunteer recruiter Wendy Sawyer interviewed Jim 13 years ago and wondered if the kids would enjoy origami. It goes without saying that she realizes that she was right. Jim makes a variety of other items from paper: stars, tetrahedrons, paper boxes and origami shirts. He patiently explains the steps to the kids and passes the time by showing them how to fold. He also encourages them to be persistent and patient. Jim doesn’t just entertain kids at the hospital. He has been known to demonstrate his skills at libraries, after school programs and even at restaurants when dining with his wife. And we’re glad that Jim decided to provide that distraction at Akron Children’s.